John Francis Williams, popularly known as Johnny Williams, was born in Watertown, Massachusetts on November 15th, 1905. If the name rings a bell, it may be because he was the father of famed film composer John Williams. The elder Williams became a well known drummer in the 1930s through his work with the CBS Radio Orchestra in New York and then with the famed Rayomnd Scott Quintet. 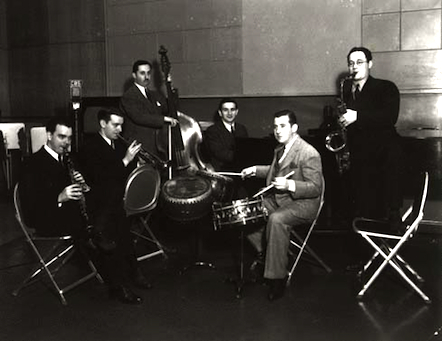 The oddly named six-piece group was assembled in late 1936 and was highly prolific from 1937 - 1939. Scott would go on to form and lead a variety of ensembles under different names through the 1940s and into the 1950s (some of which involved Williams) and was the regular orchestra leader on classic 1950s television show Your Hit Parade. But Scott's earliest fame came with his original 'quintet' and their late 1930s studio recordings of such songs as "Powerhouse", "Twilight in Turkey", and the highly recognizable "The Toy Trumpet". 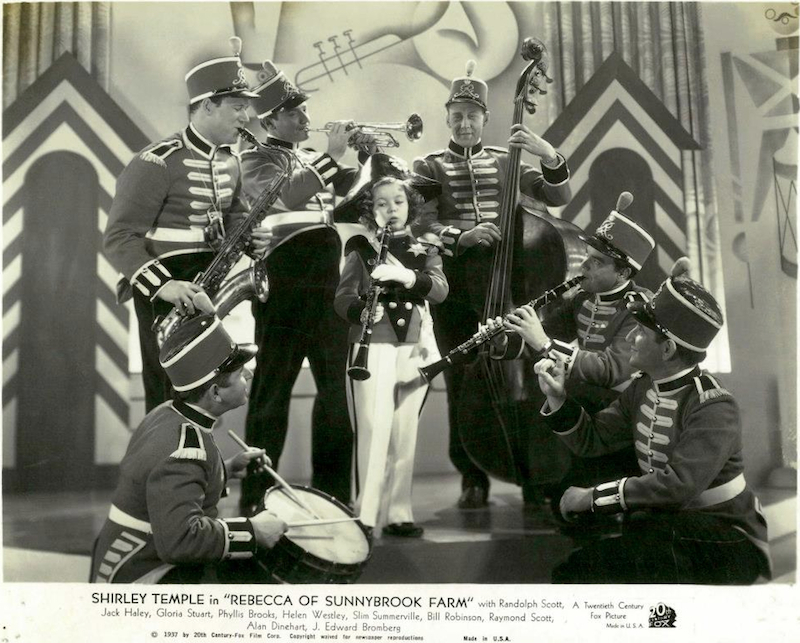 As a member of the Raymond Scott Quintet, Johnny Williams appeared in several Hollywood films during the late 1930s including Rebecca of Sunnybrook Farm (1938) starring Shirley Temple. The Scott Quintet's involvement was apparently significant enough that the musical group was featured along with Temple in photographs promoting the movie. The handsome fellow at bottom left of the below picture sharing a glance with Shirley Temple is none other than Johnny Williams with his Stone Master-Model drum. Whether or not Williams played the same drum on the Raymond Scott Quintet recordings, we may never know. But clearly Williams had an affection for Stone snare drums as he appears in many other photographs from the same time period with Master-Model drums at the center of his outfit. And he must have had more than one because pictures show Williams with Master-Model drums in at least two colors - likely white marine pearl, and black diamond pearl. 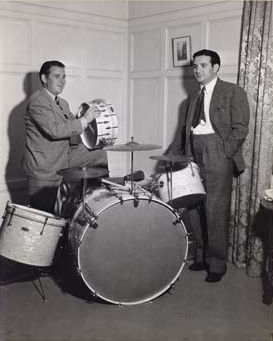 By 1939 Johnny Williams had signed on with the larger, more modern Leedy Drum Company. Most signs point to George B. Stone & Son being all but out of the manufacturing business by the late 1930s anyhow so it's surprising that Williams stuck with Stone as long as he did. As George Lawrence Stone had begun to devote his attention almost entirely to his drum school and related activities such as teaching and writing, Stone & Sons' drum making interests faded. So Williams' move to a company that could more readily supply his needs was a logical one. 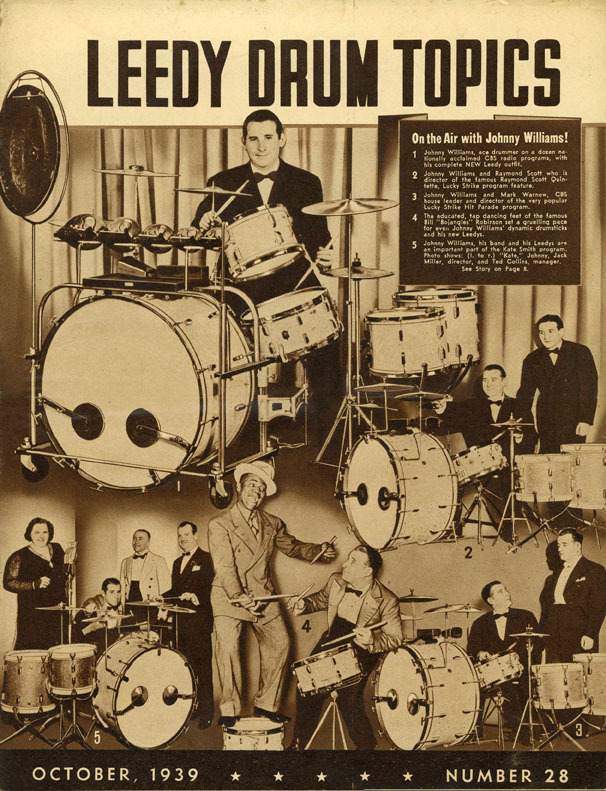 Leedy must have been proud of their new endorser as they touted him prominently on the cover of Leedy Drum Topics #28 in October 1939.